Leeds is an ever changing city. In the past few years the emergence of the Trinity shopping centre and the First Direct Arena have changed the landscape in both a physical and business sense. Such changes have thrown up new opportunities, and in some cases created new challenges, for the city’s established business community. This theme of change was at the heart of the Game Changers event held on 12th February. Hosted by two of Leeds’ up and coming businesses, The Professional and Whitecap Consulting, the event was held at one of Leeds’ most recent additions. The iconic First Direct Arena was the setting for speeches from some of the region’s business leaders and discussion on what it takes to make a mark in a changing environment. rebuildingsociety was there to hear their experiences, insights and thoughts for the future. Our very own Managing Director Daniel Rajkumar joined the panel to answer questions on how rebuildingsociety is changing the finance game and Julian Wells, Director of Whitecap Consulting (and Marketing Director of rebuildingsociety), acted as chair. 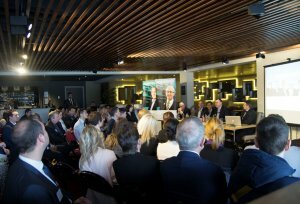 What was clear from the day was that Leeds’ development and its willingness to thrive in times of change is down to the game changing business that call it home.